Thank you for downloading TabsFolders! 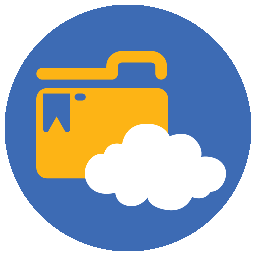 Click here to see how to Install TabsFolders. Access the TabsFolders menu by clicking the TabsFolders icon in your browser. Options Page. Here you can set the default behaviour for TabsFolders. 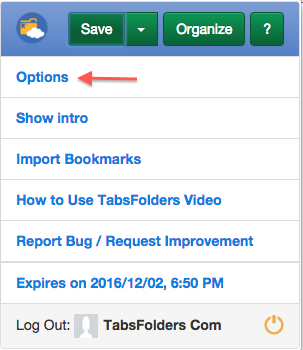 You can access the options page by clicking on the TabsFolders menu and selecting "Options". Setting the default save button action. Open the options page and select the default "Save" button behaviour. Access the TabsFolders menu and click the Save button. Click the down arrow for more save options. Select whether you want to close the tabs. Open the TabsFolders window by selecting the TabsFolders menu and clicking the "Organize Button". Within TabsFolders you can organize your bookmarks just like files on your computer. Drag and Drop or use keyboard shortcuts (CTRL C+V or COMMAND C+V on the mac). You can also Save a window or specific tabs to Bookmark folders, by selecting a list of tabs in the "Current Session" folders and Dragging them to a folder within the Bookmarks folder. Click and Drag the TabsFolders tab to the News folder in Bookmarks and the link will automatically be saved in the News Folder. Holding the ALT key while dragging will also close the saved Tabs from the open window. Opening all the Tabs in a Folder to a new window. To open all the tabs stored in a folder to a new window, just double click the folder. Or you can right click and select more options. Opening a single Tab / Bookmark. Double click on the Tab / Bookmark to open the link in a new window or right click to access more options.